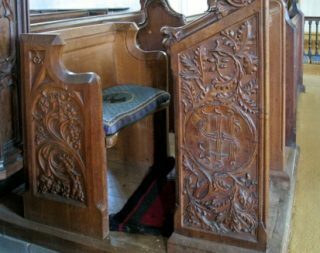 Two reading-desks for the clergy were carved in 1898 by Sidney Burgess who, with his colleagues in the local carving group, also carved the bench-ends on the pews in the north aisle. For much fine needlework throughout the church we are indebted to local ladies. Led at first by Mrs Evans, at one time Mistress of the Embroideries in Gloucester Cathedral, and wife of a former Rector, the work was continued under the supervision of the late Mrs and Miss Gibb.